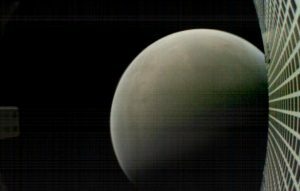 Image of Mars taken by MarCO-B from about 4,700 miles away during its flyby of the Red Planet on Nov. 26, 2018 at 8.10pm GMT. Image courtesy of NASA/JPL-Caltech. On November 26th 2018 at 19:52:59 GMT, Mars welcomed the arrival of its latest inhabitant, the ‘Interior Exploration using Seismic Investigations, Geodesy and Heat Transport’ lander, or InSight for short. This marks the 8th landing on Mars in human history, with InSight following on from Mars 2, Mars 3, Sojourner, Beagle 2, Spirit, Opportunity and Curiosity. Up until Insights arrival, Curiosity remained the only rover to be in communication with Earth, with Opportunity losing contact earlier this year. NASA’s latest robotic explorer is set to expand our knowledge of the Red Planet by delving under its surface for the first time, testing the geology of Mars’ crust, mantle and core. The mission planned to last one Mars year – the equivalent of 687 days – will look for information about the it’s formation 4.5 billion years ago, as well as try to answer the question posed numerous times, possibly most famously by David Bowie, namely is there life on Mars? An artist’s rendering of the twin Mars Cube One (MarCO) spacecraft as they fly through deep space. Image courtesy of NASA/JPL-Caltech. While Insight presents an exciting new opportunity to study the Earth’s 2nd nearest neighbour, Venus being the closest, it was not the only piece of technology sent to Mars aboard the Atlas V rocket on May 5th 2018. 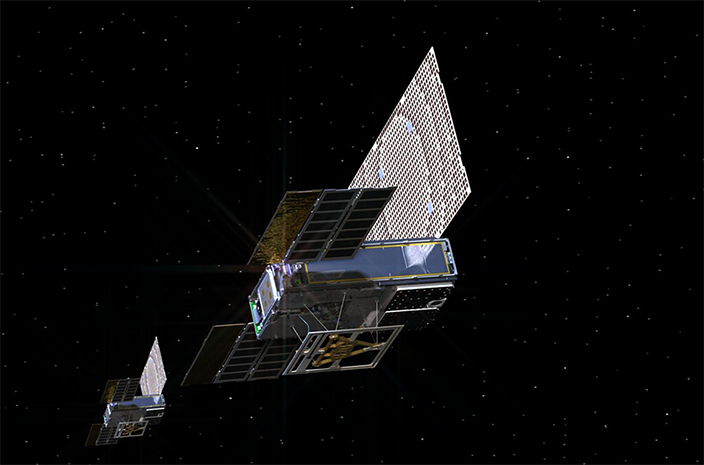 Accompanying the lander on its journey were the first two Cubesats to be sent to deep space. Mars Cube One, consists of two briefcase-sized satellites, officially named MarCO-A and MarCO-B but nicknamed EVE and Wall-E. The two cubesats are identical, and whilst neither of them carried scientific instruments they each carry an X-Band attena to direct radio waves to allow them to transmit data back to Earth, an ultra-high frequency (UHF) radio receiver to receive transmissions from Insight and a colour wide-field engineering cameras which can produce images of 752 x 480 pixel resolution. Two cubesats were sent for redundancy in case anything happening on the perilous journey to Mars. However, both made it! MarCO-B took an image of Mars on October 3rd to test exposure settings, and they have produced some stunning images of the planet since. Winter on Mars acquired by HiRISE on 27th February 2008. The enhanced colour shows shows the carbon dioxide snow as bluish-white, on the brown and red bare ground. Image courtesy of NASA/JPL/University of Arizona. The MarCO’s are the 14th artificial satellite sent to Mars with the first almost fifty years ago in 1976, and there are seven currently operational. One such example, 2001 Mars Odyssey, holds the record for the longest serving spacecraft in orbit around somewhere other than Earth, at over 17 years, first reaching Mars on October 24th 2001. Another example, the Mars Reconnaissance Orbiter (MRO), houses 6 separate instruments for the purposes of remotely sensing the planet. One of these, HiRISE, is the most powerful camera ever sent to another planet. Since arriving at Mars in 2006, the sensor has been providing high resolution imagery, at 30 cm per pixel, higher than any commercial satellite imagery available for Earth. This tool has been indispensable in helping select landing sites for Martian exploration, as well as investigating extra-terrestrial geomorphology such as glacial-like forms (Souness & Hubbard, 2012), and even image avalanches in progress. MarCo won’t achieve any of these records and as it has already achieved its mission objectives, it will continue transmitting data and images back to Earth until its fuel runs out. This mission has demonstrated that cubesats and miniaturised communication equipment, can play a role in deep space exploration and it is hoped that similar technology being deployed to more planet’s in our Solar System. This entry was posted in Data, NASA, Remote Sensing, Satellite, Space Industry, Understanding Space and tagged ATLAS, cubesat, David bowie, Geodosy and heat Transport, HiRISE, Insight, Interior Exploration using Seismic Investigations, MarCO-A, MarCO-b, Mars, Mars Cube One, Mars Odyssey, mars Reconnaissance orbiter, MRO, NASA, satellite, Space by Robert. Bookmark the permalink.